Flash fires and arc flashes are the two main reasons for wearing flame retardant workwear. To truly know the level of protection that a garment can offer to these hazards it needs to be tested. ROOTS believes that an accurate test as close to a real catastrophe is the only way to truly know how safe a garment is. For flash fires, ROOTS does the manikin where we subject a garment to 4 seconds in a simulated flash fire which gives us a body burn prediction and thus how an accurate representation of how safe it is. 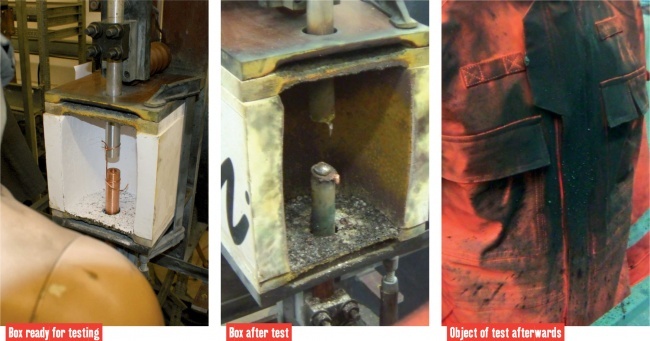 As specialists in arc flash protection ROOTS does the same for their garments with the box test and the open arc test on every single range. The box test often wrongfully referred to as the European electric arc test. The box test is the global standard for arc protection, the reason for the European assumption is the fact that this test is rarely accepted outside the boundaries of Europe. The box test is a very demanding test carried out with a small switch box in which a short circuit is enforced with the use of two electrodes, one aluminium and on copper. The box test gives out either a PASS or a FAIL as a result but does not give the value of incident energy which is usually expressed in a cal/cm2 also known as a calorific rating. It is a common misconception that the danger of arc flash is only limited to a high voltage; in fact, the real hazard lies with one of a high current. In the world of protective clothing, European and American standards are becoming more harmonised. A very good example for this is the open arc test method and standard. The open arc test is a very welcome extension to the palette of safety standards for workwear - especially for protection against an electric arc. Where the box test only states a PASS or a FAIL, the open arc test gibes a calorific rating which is an excellent way to show the level of protection that wearers can expect from a garment, or from layered clothing systems. Before a garment is tested and rewarded with an IEC 61482-2 standard, the fabric needs to be tested. The minimum requirement for achieving a calorific rating is a total of 7 shots across 3 different panels (see photos of test cradle below), which means that a total of 21 pieces of fabric are tested. After the fabrics are tested, the next stage is a garment test before the certificate and rating can be rewarded. Note that a fabric with an ATPV or EBT rating below 4.0 cal/cm2 results in an automatic fail and therefore cannot be certified. Arc rating (as tested in ASTM F1959) can result if two types. EBT - This the 50% probability of a 1'' crack in the material in the 8 kA test on a flat panel. A lot of people are unaware of the fact that garments offering protection against an arc flash should by definition have an ATPV (arc thermal performance value) or an EBT (energy break-open threshold) value. Where the petrochemical and oil & gas industries are primarily protecting themselves against the risks of flash fires the industries that deal with energy generation and transportation are primarily faced with the risk of an arc flash. In both cases, these risks are being combatted by FR workwear even though the requirements set are completely different from each other. Many companies think that they are done after they buy garments simply conforming to IEC61482-2 class 1 or 2. This is pertinently incorrect. Adequate protection is only offered if it is known to what degree a garment or multiple layers of clothing together protect the wearer. This is made clear in the table below. This table shows all of the calorific values that apply to the ROOTS collection. The values in the table are in ATPV or EBT. Whichever value is shown is always the lower of the 2 that may be published as a result of the certificate. If an EBT value is shown instead of an ATPV this means that the test fabric broke open on the point of attaining this score. As a result, the ATPV value of the tested fabric is higher than its EBT value. If the ATPV value is shown in the table this means that the highest ATPV value was achieved before the fabric could break open.